โปรดกรุณาอย่าเก็บไว้แต่เพียงผู้เดียว ข้อมูลในแผ่นพับสำหรับดาวน์โหลดฟรี ท่านสามารถพิมพ์แผ่นพับ และแจกจ่ายแก่คนอื่นได้ด้วย ! Note that the file is large and downloading will take some time. Please be patient. There are 68 million Thais. Many who get this brochure will definitely accept and worship this great being. I so happy to see this. The website here really can benefit people in many ways and styles. Very hardworking. I thank you for your kindness to Thai people. 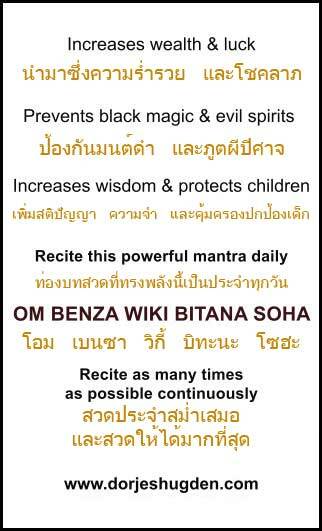 This website has taken great pains to produce this wonderful Dorje Shugden brochure in Thai. I’m sure a lot of hard work has gone into the writing, designing and printing of the brochure and card. May Dorje Shugden reach many Thai people and may these fortunate ones be blessed by the King. I wish this brochure can be translated into Japanese. There are 126 million people in Japan who can benefit so much from doing this practice. I ever met in my life! 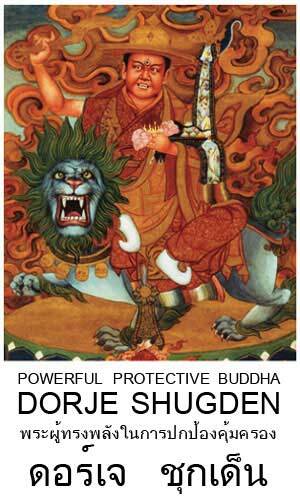 I WOULD KNEE DOWN TO EXPRESS MY CONTRIBUTION “BODY, MOUTH, AND MIND” TO DORGE SHUGDEN!